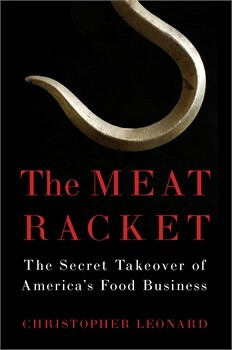 This past weekend, we opened our Winter Meeting with Christopher Leonard and a discussion about his upcoming book, The Meat Racket: The Secret Takeover of America’s Food Business. Leonard, a former AP agribusiness reporter, discussed what he learned about the meat industry and the struggles of livestock growers in the business. It was an honor and a privilege to have this conversation with him over dinner, which included sustainably, family farm raised ham from Patchwork Family Farms and cheese from Cheddar Grove. Please request his book at your local library or bookstore, follow his blog or his book tour, and check out his Facebook page for more information. This entry was posted in Blog and tagged Consolidation, COOL, Family Farms, GIPSA, Meat Industry. Bookmark the permalink.